Travel to and within the U.S. grew 3.8 percent year-over-year in August, according to the U.S. Travel Association’s latest Travel Trends Index (TTI)—marking the industry’s 104th straight month of overall expansion. Despite the positive trend, U.S. Travel economists remain wary that the decelerated rate of international inbound travel will cause the U.S. to fall even further behind its global competitors. Most notable in the TTI is the strength of domestic leisure and business travel, supported by strong consumer spending and consumer confidence reaching heights last seen in 2000. Both domestic leisure and business travel grew in August, with business growing faster than the leisure segment for the second time in the past five months. According to the six-month Leading Travel Index (LTI), domestic travel is expected to grow at a rate of 2.6 percent through 2019. Worryingly, international travel is only expected to grow at a rate of 0.6 percent in the same period. While the present is rosy for domestic leisure and business travel, there is reason to believe that the domestic travel market will soften in the coming months, as overall economic growth is expected to slow through the end of the year. 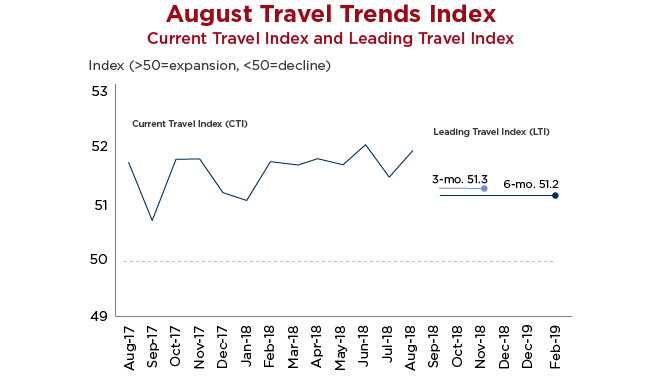 International inbound travel growth improved slightly in August to a pace of 1.2 percent year-over-year. However, U.S. Travel economists are concerned that the rate of growth—while positive—is not accelerating fast enough to allow the U.S. to regain its slipping share of the global travel market. Calculations based on revised U.S. government arrivals data find that the U.S. share of the global travel market slid from a peak of 13.8 percent in 2015 to 12.2 percent last year.